« There’s nothing to Dredd but Dredd himself. 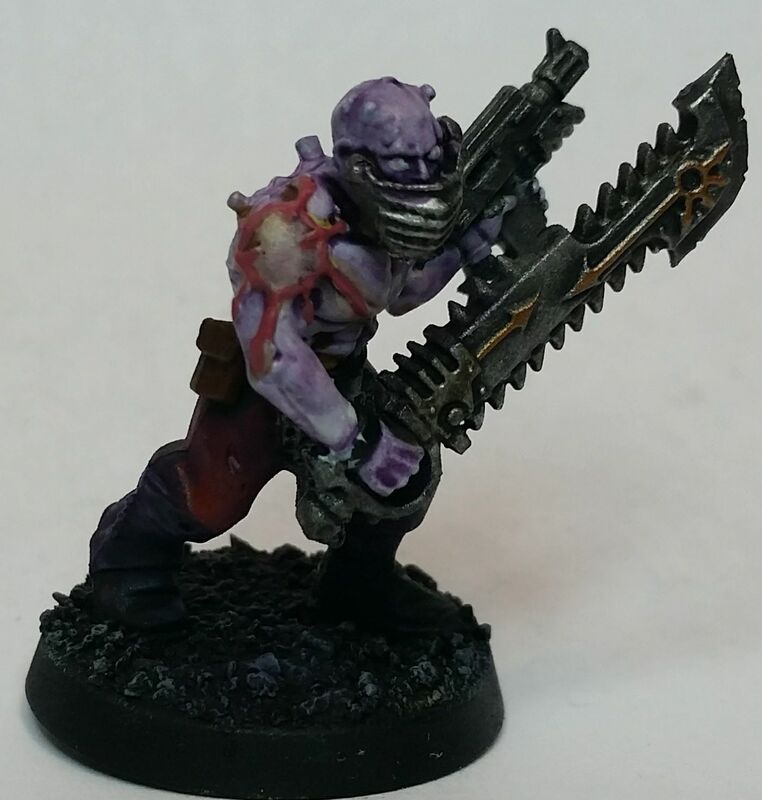 Meet The Cultist is a weekly feature focusing on some of the least regarded members of a Warhammer 40k Chaos Army, the cultists. In the game they are cannon fodder or a distraction at best, yet I find examining the sonder of their lives interesting. While chronology isn’t particularly important, you can start at the beginning if you care about reading them in order. Once upon a time Sekrax had the voice of an angel. He had a promising career as an entertainer on Poulionus, a hive world which was far enough from the regular trade lanes that it seemed the Imperium turned a blind eye to the active trade agreements with the expanding T’au empire. And if the effect of his voice hadn’t been so pronounced he might have done a tour on various T’au occupied worlds singing to Gue’vesa, betraying the Imperium in a small and fairly insignificant way; but that’s not how is story went. Instead his performances brought money, fame, and fans: drugs and other excesses soon followed. Everybody knows Slaanesh cultists throw the best parties, and once he’d tasted the mind bending extravagances provided by the petitioners of She Who Thirsts there was no turning back for Sekrax. Before he sang for money, and fame. Now he had a purpose; his voice a living prayer to Slaanesh that enthralled and intoxicated any who heard it. His presence on the battlefield was usually restricted to the back lines, where his voice was piped through amplifiers and thence to a Noise Marine who used the melodious tones to fire off devastatingly distorted sussurances that were felt rather than heard and left the affected foes writhing in pleasure even as their overloaded nervous systems shutdown from the magnificent over stimulation of it. Then, while raiding for liquor on a Nurgle infested agri-world, Sekrax’s luck ran out. Some pestilential wind passed over the his squad and whatever noxious vapour it was ruined his voice. Everyone knows that it was Zygor’s fault, but only Sekrax knows the truth; his gas mask was fine, he was just t0o slow getting it on. Initially he was too embarrassed to clear Zygor’s name, not expecting the alacrity or severity with which punishment would be meted out. Now it’s been several months, and Zygor seems to have accepted his fate so Sekrax channels his guilt into battle. His chain sword will just have to sing for him. Many lament that Tudax joined after Sekrax had lost his voice, but the truth is recordings never could touch a live performance; it was as if the was some magic in his voice that couldn’t be captured by a box of metal and plastic. This entry was posted on Friday, November 10th, 2017 at 8:30 am	and is filed under Meet the Cultists. You can follow any responses to this entry through the RSS 2.0 feed. You can leave a response, or trackback from your own site.